The troposphere is the lowest major atmospheric layer, extending from the Earth's surface up to the bottom of the stratosphere. The troposphere is where all of Earth's weather occurs. It contains approximately 80% of the total mass of the atmosphere. The troposphere is characterized by decreasing temperature with height (at an average rate of 3.5 degrees F per thousand feet, or 6.5 degrees C per kilometer). In contrast, the stratosphere has either constant or slowly increasing temperature with height. 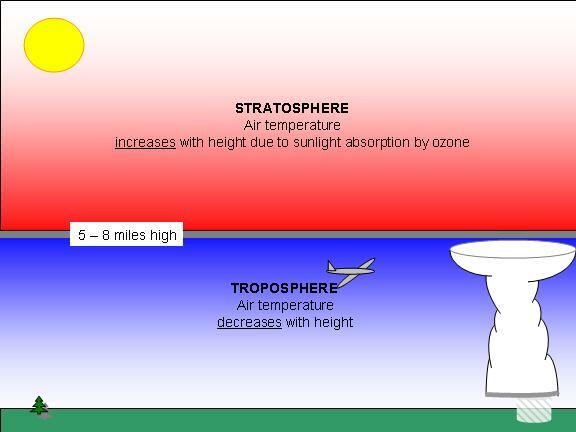 The boundary between the troposphere and the stratosphere is called the "tropopause", located at an altitude of around 5 miles in the winter, to around 8 miles high in the summer, and as high as 11 or 12 miles in the deep tropics. When you see the top of a thunderstorm flatten out into an anvil cloud, it is usually because the updrafts in the storm have reached the tropopause, where the environmental air is warmer than the cloudy air in the storm, and so the cloudy air stops rising.